Order your Montegrappa Aviator Ballpoint Pen today from FahrneysPens.com. Fine Pens, Refills & Luxurious Gifts – great prices & fast shipping. From the producers of grappa to great chefs, to lawyers and psychologists, to sommeliers and musicians and doctors, Montegrappa dedicates pen collections to professions, and creates visual themes to honor them. Now they celebrate the bravest of the brave: airplane pilots. 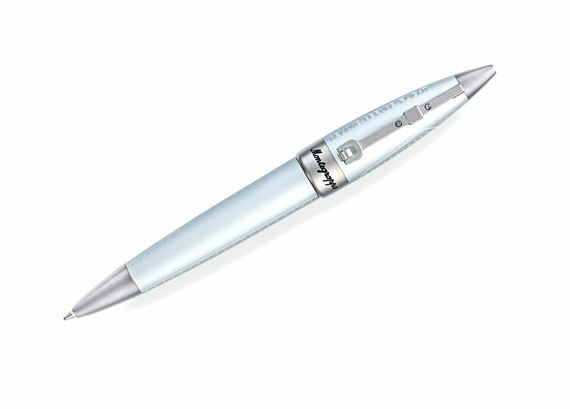 To evoke the trap- pings of aircraft, the Aviator pen is made entirely of aluminum. Its rounded, aerodynamic profile conveys the laws of flight, its curved barrel blending into a sharpened cap, to resemble both aircraft and rockets. The pen in- cludes design details found in the aviation industry: “stitching”-style rows of “planks” secured with tiny rivet heads, fuel tank apertures, and the “Remove Before Flight” and “No Step” commands etched on the pen. The clip bears a complex, technical design shape reminiscent of landing gear struts, with the classic Montegrappa rotating ring re-imagined as a knurled ferrule. The Aviator pen is available in fountain pen with steel nib, capped rollerball and twist ball pen. Montegrappa ships each Aviator pen with a bonus – the ‘aviator goggles’ zip case will hold and protect both your pen and a pair of eyeglasses!